There are about 90 species of scorpions in the United States and and estimated 1,500 species worldwide. There are more than 40 species in Arizona. Those number are constantly changing as new species are discovered, classifications change, and some species become extinct. Scorpions have four pairs of legs. They also have pincers that look like little lobster claws. 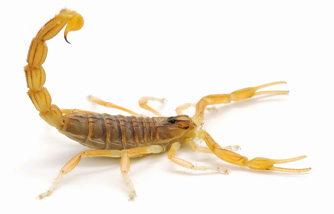 In the western U.S. only one species of scorpion venom is considered very dangerous to humans. It is called the Arizona Bark Scorpion.